A conspicuous restlessness among artists and curators have them abandoning their studios, workspaces, and routines, not only in pursuit of a subject but also of a practice. Frequent, recurring and extended stops are points on a trajectory with an indefinite end and undetermined destination, though the usual stations are familiar: international biennials, residencies, and academic institutions. An unwillingness and sometimes an inability to settle, coupled with the attraction of other less-known and more brightly glittering places has led many to identify themselves with the “new nomads”. This type of life, with all its attendant benefits and images of success is like any other mirage: it sparkles, it is seductive, but it is not there. Where is this place between borders and who are the new nomads? 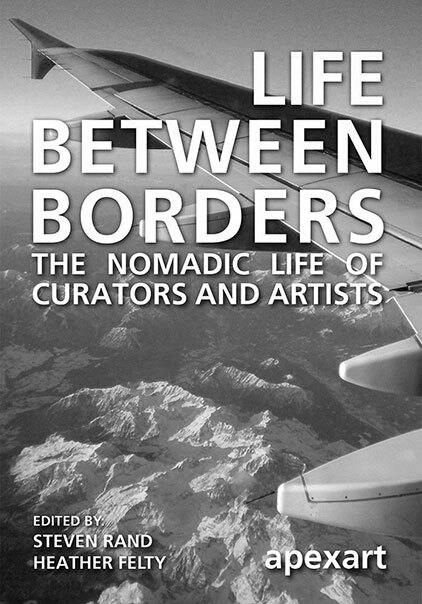 This collection of ten short essays published by apexart and edited by Steven Rand and Heather Felty problematises the practice and trend toward a nomadic life among artists and curators. A few of the remarkable commonalities among the contributors include a shared interest in identity issues and a fascination with changing borders, as well, almost all of the contributors try to differentiate nomads from migrants. Deleuze and Guattari’s 1227: Treatise on Nomadology serves as a key source for many of the writers here, and the wildly varying interpretations that appear in this book show just how little has been agreed upon when defining the word “nomad”. Niels Van Tomme’s stand-out essay gives an excellent and succinct analysis of the terminology by criticising the use of the word “migrant” as it relates to “our celebration of the so-called new nomadic lifestyle”. He asks how one can “possibly conceptually link such alienating and incompatible existential conditions when one’s lifestyle depends on the smooth global flow of cultural capital and artistic exchange?” He cites a case where local inhabitants (migrants) in Lampedusa set up a “Museum of Immigrants” at their own expense, and points to this as a reference where the global art worker may find “novel ways of joining the fight against the injustices these people invariably face,” instead of associating their own artistic plights with severe hardship and the disenfranchisement of migrants. Pascal Gielen also sharply criticises the romanticisation of the nomadic life, arguing that, “the positive aura that today is fairly smoothly generated around travel, mobility, agility, unattachment, and even homelessness makes it likely that the term has become part of an ideology…” He thus produces the neologism, “nomadeology”, a clear departure from Deleuze and Guattari’s “nomadology”. Gielen discusses the role of the artist as one with a highly individual position and definitively links this position to problems involving authorship, ownership, the art market and capitalism. He comes up with a brilliant and original thesis towards the end of the essay, concluding that, “nomadism as an artistic strategy only makes political sense if it is communist”, referring here specifically to the stateless, communist ideal. Both of these arguments are of consequence, but neither of them address the difficulties that the regular residency-hopper faces, including problems specific to artists and curators who use residencies as a substitute for a home base. The essays fail to address the unique demands placed upon artists, especially the pressure to contribute to local life and to address local issues in their temporary abodes. More and more art-workers end up without any of the local benefits: health care / insurance, language fluency, a stable economy, and family ties. More attention should be paid to this sense of disempowerment that often accompanies this constant movement, even though their mobility is often considered a privilege. None of the authors address the sedentary mobile, or whom sociologist Zygmunt Bauman refers to as the “global mobile elite,” those who have the privilege of living in time as opposed to living in space.1 This inevitably brings us back to Deleuze and Guattari’s qualification of the nomad as someone who “moves, but while seated, and he is only seated while moving…”2 or rather, someone who moves in time but not in space. The book does present a few examples of what nomadism without physical movement could entail: Mekbib Gemeda writes a sincere personal account of how language serves as a means of cultural transformation and as a site of passage. Jimmie Durham’s biographical narrative about his library and his memory adds something fanciful to this collection, suggesting the notion that perhaps memory is a type of a nomad, or that a nomadic life can be found through reading. Again, this is very different from the art-worker nomad who sits in front of a screen. It is yet another omission on the part of contributors to this book, which is strange considering that “mobility” has long been defined as much more than mere physical movement. It is only with this reading of mobility that Heather Felty’s introductory assertion that “you have to be mobile to ‘make it’ in the art world” can have any value or make any sense. After all, there is an obvious need to expand our definitions of “mobile,” “the art world,” and “making it” and, fortunately, some of the essays in this small volume manage to do this. Notably, Lamia Joreige circumvents questions of identity, borders, and semantics as she admires those who stay put, refuse to learn and speak an international language and refuse to let themselves be reduced to their identities. Her closing remarks bring to mind the little-heeded call of artist Gustav Metzger’s Reduce Artists Flights (RAF) initiative in 2007, that invited “voluntary abandonment – a fundamental, personal, bodily rejection of technological instrumentalization and a vehement refusal to participate in the mobility increasingly endemic to the globalized art system.”3 Though it’s an obvious reaction to the trend, staying in one place, even within borders, might also be one of the most effective ways to gain political and personal agency. 1. Zygmunt Bauman, The Individualized Society (Cambridge, UK: Polity Press, 2001). 2. Gilles Deleuze and Félix Guattari, A Thousand Plateaus: Capitalism and Schizophrenia (London: Athalone Press, 1988). 3. Max Andrews Web, reduceartflights.lttds.org. Marianna Maruyama (1980, California) is an artist based in the Netherlands. Through writing, audio recording, drawing and play, she looks for ways that sound and movement facilitate an understanding of position. Orientation and voice, specifically loss of position as it relates to loss of voice are dominant themes in her practice. She studied at Oberlin College (USA) and the Dutch Art Institute and moved to the Netherlands from Japan. See further: www.mariannamaruyama.com. A brief summary – as found in the paragraph above – makes us forget what immaterial labour actually requires from people and, accordingly, what drastic consequences the new form of production has for contemporary society. For instance, mobility is often defined as increasing physical mobility, the negative aspects of which we encounter frequently: traffic jams, overcrowded trains and pollution caused by, among other things, a vast number of planes in the skies. The employee no longer lives his entire life near the factory or office where he works but moves regularly – as a result of promotion or relocation – not only from one workplace to another but also from one house to another. Apart from the growth of physical mobility, mental mobility is becoming an increasingly essential part of our present-day working conditions. After all, the immaterial worker works primarily with her head, a head that can – and must – accompany her everywhere. Immaterial labour does not cease when the employee shuts the office door behind her. It is easy for the worker who performs immaterial labour to take work-related problems home, to bed and, in the worst-case scenario, on holiday. The worker can always be reached, by mobile phone or email, and summoned back to the workplace within the moment or two it takes to log on. Mental mobility makes working hours not only flexible but fluid, blurring the boundary between private and working domains. The burden of responsibility for drawing the boundary rests almost entirely on the shoulders of the employee. The foregoing outline makes rather a depressing impression, but many a person who does immaterial work experiences it as such, as evidenced by the increase in work-related stress and depressions. One cause of depression is an ongoing sense of having too much on one’s mind and of being constantly reminded of this fact by the working environment. Perhaps a creative idea is still nestling somewhere in the brain: a conclusion based more on a socially conditioned criterion than on anything psychological. The knowledge that you can go on looking, that you may be failing to utilize a possibility still lodged in your brain, can lead to psychosis. Burnout is not necessarily the result of a person feeling that his ideas have not been fully exploited. On the contrary, it is rooted in the frustration that an unused, passive zone exists within the cranium that can still be activated. The worker who can no longer stop the introspective quest for inventiveness may find himself falling into an abyss or looking for escape routes, such as intoxication, to momentarily halt the thinking process. He deliberately switches off his creative potential. However, contrasting with this very one-sided and sombre picture of the effects of immaterial labour, it must be said that it can also liberate a form of mental labour. After all, no-one can look inside the head of the designer, artist, engineer, ict programmer or manager to check whether he is actually thinking productively – that is, in the interests of the business. It’s difficult to measure the development of ideas. A good idea or an attractive design may escape from the brilliant mind of the immaterial worker in a matter of seconds, or it might take months. What’s more, the same employee may be saving his best ideas until he’s accumulated sufficient capital to set up his own business. Anyone possessing immaterial capital can participate unseen, and in this case invisibility can be taken literally.